Director Bala is busy with his upcoming film Tharai Thappattai which is said to be an action film. Sasikumar and Varalaxmi Sarathkumar are the lead characters in the film. Director Bala has stated that Studio 9 producer R.K. Suresh will be playing the villain in the film alongside Sasikumar. We hear that his character in the film has been well crafted and Suresh is happy to have Bala's film as his launch pad. Well, this will be a dream debut for a producer. 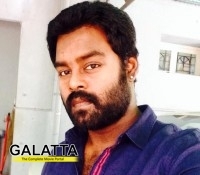 Galatta team wishes R.K. Suresh good luck in his acting venture.